Following on from French bespoke style with Camps de Luca, we now arrive in Milan with Ferdinando Caraceni. Milanese tailoring has quite a distinct style, with light structure overall but a strong shoulder. So while tailors from Milan will talk about their jackets being light (that you could in fact screw them up into a ball, as Nicoletta Caraceni does to demonstrate the point) there is a little more padding in the shoulder than the French, and the look is quite square overall. This square look is the culmination of three things: a padded shoulder, which raises it up; a wide shoulder (this Caraceni is almost an inch wider than the Camps de Luca); and a natural shoulder, so a lack of roping at the top of the sleeve. So the shoulder line runs out quite square to the body, goes further than the natural shoulder, and then drops straight down. This jacket, in a lightweight herringbone cashmere, was made for me by Nicoletta Caraceni (the daughter of Ferdinando, who is sadly departed) in 2014. I had wanted to try the Caraceni style for a few years, and picked Nicoletta rather than one of the other Caraceni houses (the largest is A. Caraceni, also in Milan) because we got on so well. I subsequently had some trousers made to go with it, by Graham Browne in London, as I thought it would look nice as a suit. 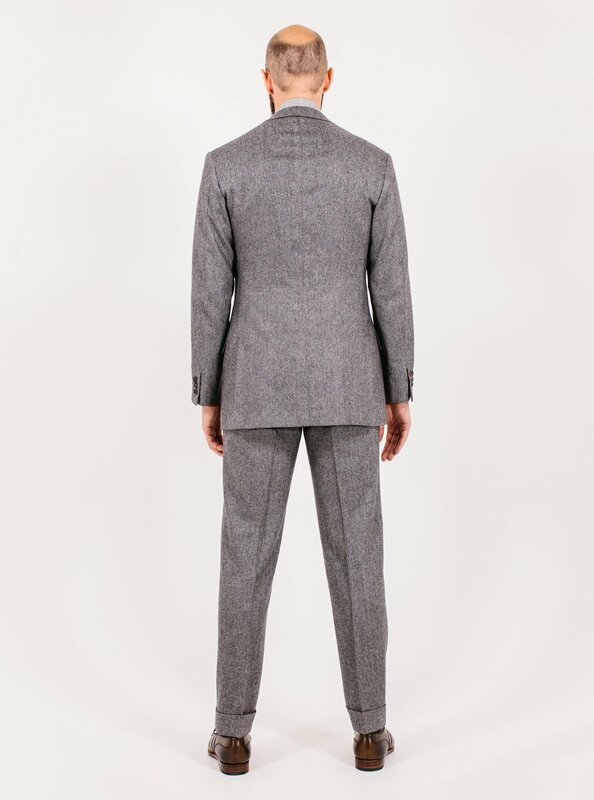 However, while the look of a grey herringbone suit is nice, the material was really too light and soft to make into trousers, and I usually wear the jacket on its own. It is a 9.5oz cashmere from Cerruti (offered in the UK by Dugdale). Returning to that shoulder line, I think this cut makes for a striking yet lightweight suit, or a smart sports jacket, but not for something so casual as to be suitable for jeans or chinos. I find this interesting, because even though the sleevehead is as natural as any Neapolitan, the padding and the width keep it relatively sharp and formal. The quarters (below the buttoning point) are also relatively closed, though they do curve away with a nice rounded shape at the bottom. The lapel is relatively wide (3¾ inches) but doesn’t appear as strong as some lapels because it is so sloped. If you look at the gorge line – the seam where the lapel and collar meet – this runs down quite steeply from the neck, and then only straightens up slightly when it becomes the notch of the lapel. That bottom of the notch is normally closer to horizontal – which some consider to be more flattering, as it suggests width. 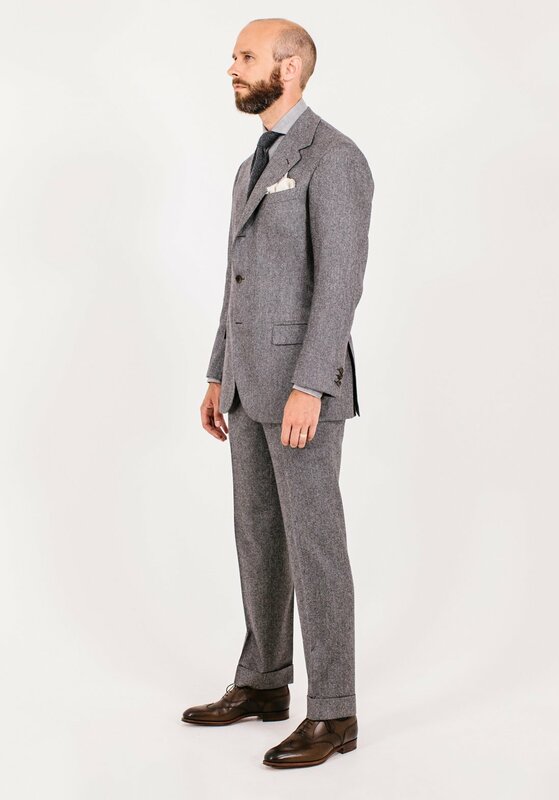 The whole notch itself is also relatively low on the chest (4¼ inches from the shoulder seam), although only compared to many modern ready-made suits, which often have this gorge point ridiculously high. And lastly and most subtly, the collar and lapel sections of that notch opening are the same length (1½ inches) which is quite rare. Normally the collar would be a touch shorter. Elsewhere on the jacket, the chest is quite clean with little drape; there is definite shape through the small of the back; and the sleeve is fairly standard but with a relatively wide cuff (11¾ inches). The pocket flaps are small, at 2 inches, and so are the vents at the back (9½ inches) – the latter in proportion to the overall length, which is relatively short (31¾ inches). The lapel is quite straight, and therefore looks convex as it curves away from the waist button, with a little rounding at the top. And the jacket is made without any front dart or seam. Although I would generally warn against drawing any conclusions about fit from these pictures – particularly in such a soft, lightweight cloth – there is a little tightness across the top of the back, which I have meaning to correct for a while. Unfortunately Nicoletta does not travel to London and I haven’t been to Milan for a couple of years. The work generally is extremely fine – the best of the Italians, and on a par with any English maker. There is also more of that handwork than on an English suit, with lapped seams all around the jacket. These barely show, given the texture of the cloth, but the volume and fineness of this handwork is one reason Caraceni is expensive. The work extends to the inside of the jacket, with the long seams on the lining all done by hand. As with all posts in this series, the accessories were supplied by Anderson & Sheppard – and we went for a very stylised look, with a tonal combination of greys and cream. 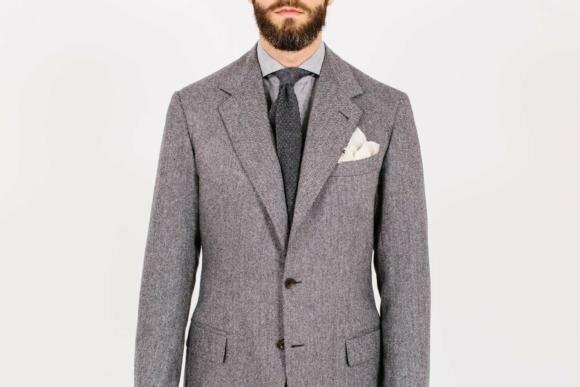 I’ve always liked grey shirts with this jacket (this one is a brushed cotton from Simone Abbarchi), but the combination is rather showy for me. Most of the time I’m more likely to wear it without a tie, and dark trousers (often brown – as in this post), which is still distinctive but rather more subtle. The shoes are the Beaulieu model from Edward Green – an unbrogued wingtip. I quite like it with this suit (EG calls it ‘juniper’) given its muted colour. As with most of the tailoring in this Finest Tailors series, this suit has been covered elsewhere during its making. Those posts are worth a look as an insight into the bespoke process, and to my thoughts on the tailor throughout. 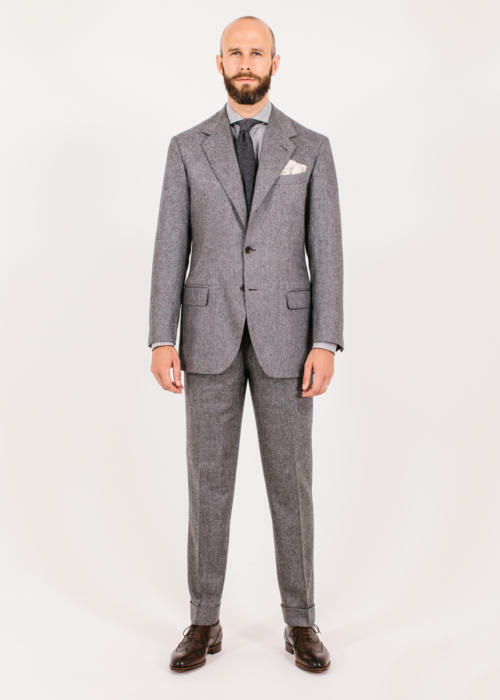 You can follow the discussion on Ferdinando Caraceni herringbone suit: Style breakdown by entering your email address in the box below. You will then receive an email every time a new comment is added. These will also contain a link to a page where you can stop the alerts, and remove all of your related data from the site. 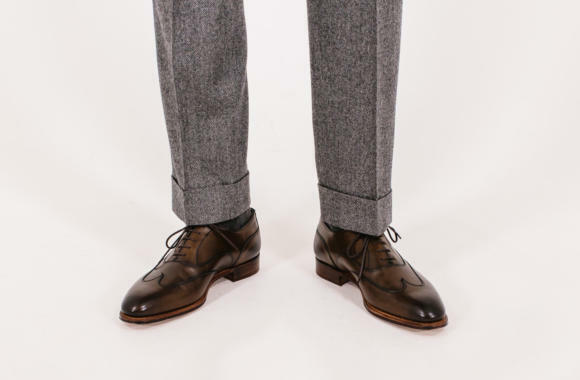 The right trouser leg appears slightly shorter than the left. I’ve been following this blog since its inception, and I can honestly say this is one of your better looking jackets/suits. For some reason a large majority of the british tailors you’ve used seemed to mess up your shoulders and it throws the rest of the outfit off. Caraceni got the shoulders right and everything else on the jacket flows. If you were a “normal” customer I would tell you to stick with F. Caraceni. Glad you approve Jason. What does your mentor think? My mentor would say don’t use someone English when you can use someone French. I noticed A Caraceni sleeve head is unusual: wide and kind of flat. Something F Caraceni would generally not do? Was Cifonelli covered or did the series skip from Camps to Luca to Italy? I really like this one. I did not know that Milanese tailors would ever cut without a front dart, and this cutter was certainly up to that challenge. It does contribute to the boxiness, since the chest fit very close but the waist does not in front. For that reason, I don’t find undarted jackets all that flattering. I like to see more fullness in the chest, but this still looks good. It’s a lovely herringbone too! I appreciate your ongoing work and efforts. But since the very first article I do not like the way you take your photographs. And I think the do not show your tailor’s work correctly. Every suit or garment is odd looking often because of the way your are standing in the moment the photograph is taken, and I am not thinking of fashion photography here which would be not right. It has even the impression that you feel not well wearing the piece your are reporting about. It is my impression and I want to let you know this view in order to make your blog even better. I am very long into bespoke suits, garments, shoes and glasses and have permanently getting things made. The first rule for bespoke is however it must be spot on. Nothing less, really nothing less! And that I am missing when reading your blog and seeing the results. Please accept my direct words. I appreciate how much efforts you are doing into this and that you let us all be part of it. Very kind and open. Thank you. Thank you Peter. The comments are certainly taken in the open spirit in which they are given. The issue is that most photos, including many I take, are intended to flatter the suit and the wearer, to make it look as good as possible. I’m a big fan of the the cold, clear consistency: makes for very informative comparisons. I truly appreciate this objective and scientific approach in the photos and text. Nice suit. But, yes, you have bunching at the top of your back. Are you saying this is from the cloth or is it from the jacket being too small on you or some other reason? Is that tightness there because your body has changed? or has it been there since you took delivery of the jacket? Don’t you find that unacceptable from a bespoke tailor, particularly a high end one? If I learned something from this site and the others I read to educate myself, is that fit is the most important thing and (good) bespoke offers a fit that can’t be matched by ready to wear or made to measure. After the fittings done, the waiting time and the ton of money shelled out, I would not expect to see those issues. As mentioned, it’s a minor issue that looks worse in the photos – in person I doubt you would notice it. Also, it’s important to realise how great a fit bespoke delivers that will never be shown in photographs like this. You have to move in it and wear it to realise that. These images are to show style, not fit. Lastly, it’s a mistake to see bespoke as delivering perfection the first time. Whether it’s because you don’t know what you want, or because any tailor develops the fit for you over time, the second piece will always fit slightly better. job. P.S. : he is not related to the other two Caraceni houses in Rome and in Milano, even though the families originated in the same town of Abruzzo ( I am sure you know this). As your suit was made in Milan does it have a Milan buttonhole? The name comes from the brand most commonly used by French (and Italian) tailors, “La Milanese”. It was manufactured by a conglomerate of Milanese firms, hence the name. Fascinating stuff, these tailoring terms. A bit like “Goodyear” for welts. I can see an obvious similarity on the lapels of their DBs with those of the Milanese and Roman houses. They all have the “olive leaf” shape (just a hint) : it is something that Ferdinando took home from his days at the original Caraceni. Are your EG MTO or bespoke? Neither – RTW. And they aren’t mine, they were just supplied for this shoot. 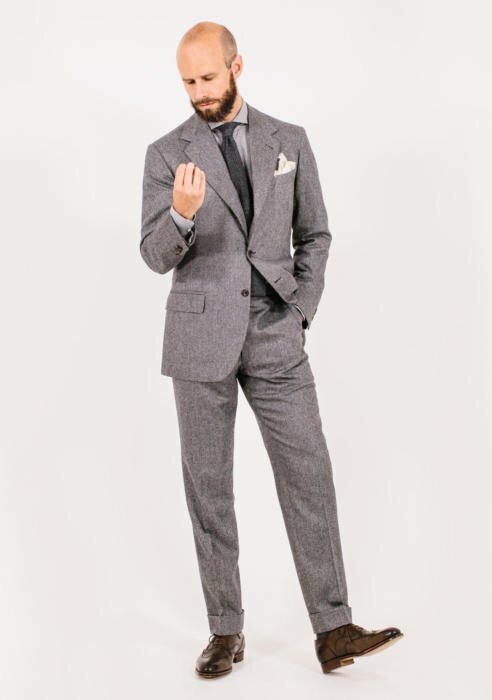 I like the suit with one exception; the bottoms are far too narrow and the trousers are too tight – such that it throws the silhouette as a whole out of balance. The tie is A&S cashmere I assume. I never considered a cashmere tie before but something about that chunky textured beauty really set that suit off. Lots of similarities with the Florentine style and, as with your Vestrucci jacket, the relatively high button stance and concave lapel edge both shorten the torso and narrow the chest. The resulting look is “stuffy,” like the jacket’s swallowing the wearer even though the shoulder fits perfectly. The other problem is the hourglass posterior silhouette running from the waist to the bottom of the jacket. Rather than a straight flare, the line is very concave at the waist and then very convex at the seat. It gives the impression of a corseted torso. Thanks for this post. I’m enjoying this series very much. Thanks. It’s worth comparing the numbers on the buttoning points – this isn’t that low. Absolutely. The button stance is just one of several contributing factors. A comparison with your Whitcomb & Shaftesbury flannel, whose fit I much prefer, makes stark the difference in apparent “openness” (i.e. apparent prominence of chest and length of toros). So, if I read this correctly the trousers were made by G Browne – not Caraceni. This fact sits uneasily as, in all honesty, the total garment is initially presented as a whole Caraceni unit. Ostensibly there should be no problem with this by I think it certain that should Caraceni have made the trousers, even with your identical input, the cut and finish would be different – better I think – they seem a tad short and the silhouette less clean than might be expected. Therefore the suit’s overall silhouette, if it were completely made by Caraceni, would be have been superior? 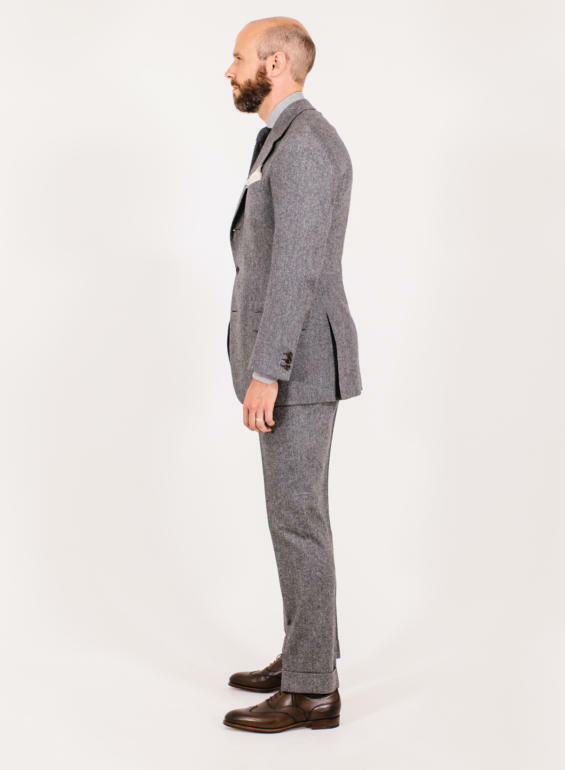 Not necessarily – there’s nothing here to see in the quality or finish of the trousers, merely the line. And if anything Graham Browne tends to cut a wider trouser than Caraceni, it’s just not what I asked for. I think the text of the article is clear enough about the provenance of the trousers. However, one might think the title of the article should use “jacket” rather than “suit”. Agree with others that this continues to be a very valuable series. I’m thinking of doing this! Have the jackets made Neapolitan and the trousers made by Graham Browne or another city tailor. Would I miss out greatly in terms of make and quality of construction? Assuming I used quality cloth of course! Re. the staging of the shoot – I understand Peter’s point and your gracious response about clinical examination – however the point might gently be made that though not a fashion shoot your posture detracts from the ability to judge the efficacy of the cut. The first image shows a slightly twisted torso (throwing the balance), the last displays a slight hunch or stoop, throwing the chest line and pushing out the seat. Foot stance is also too wide causing slight tension in the upper body. It all sounds too critical – nothing personal – but if the suit is to be correctly judged then a more upright, balanced and relaxed attitude should be struck. A request for the book – could you include something demonstrating suit construction and patterns much as Richard Anderson did in his recent book. Thank you. Thanks. I do know what you mean, but I am trying to stand as naturally (and still!) as possible. I’ll see what we can do on construction points in the book. It will be about style of the great tailors rather than make mostly – otherwise it would get very large very quickly. The tie looks great. Is it cachemire? That sounds very narrow, but if you want that, fine. I would proscribe any width at the knee, rather I’d look at what your tailor suggests, and consider whether you like the line or not, and whether being slimmer is practical or not. When I was a kid, I thought all suits were this pattern, it’s what my dad wore. To me, pattern feels dated and stodgy (again biased) but as a Winter suit I guess it’s fine. Hard to complain about a cashmere suit. Interesting how personal and generational such associations are isn’t it? Hi Simon, brilliant suit. May I ask how you take the shoulder width measurement? How does the milanese style (Careceni) compare to a Florentine style (ala Liverano) in terms of both the style and the comfort? Again, appreciate your really candid posts! Liverano will.be next in this series Jay, so perhaps wait for that if you don’t mind? FWIW, I really like the cut of the trousers… and the jacket is a beaut!! I particularly like the lapel that eschews all the silly extremes (like the ‘strangle-high gorge) so common in tailoring these days. 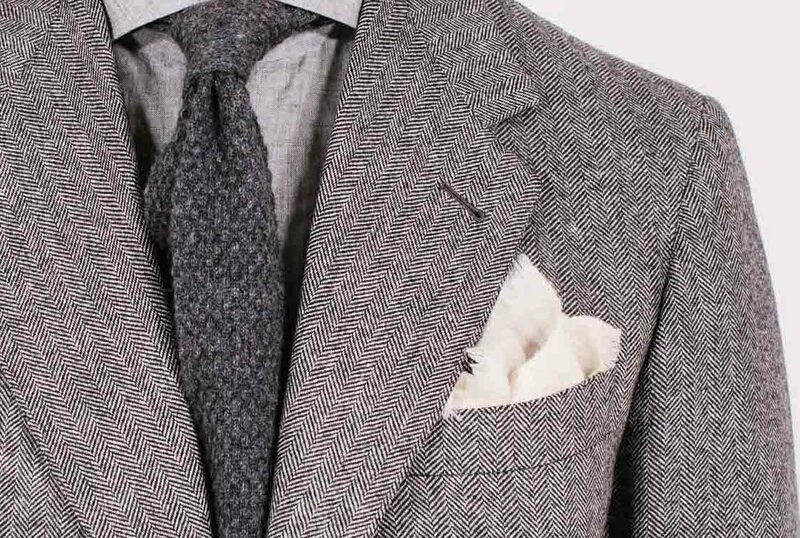 This is indeed a very “Milanese” lapel in the sense that it’s super-balanced, super-understated. A father’s suit, a businessman’s suit; not a ‘showbiz’ suit, if I may. Did you see my post re the fit? Simon, the shoulder measurement is confusing. Does that mean the shoulders are 13.25 inches across?? I have to say Simon that for such a well respected house I find the standard of fitting poor. The right sleeve looks longer than the left. The back scythe on both right and left is untidy. The back hem isn’t level and the sleeves look like they may be pitched too far forward. This work does not compare with Camp de Luca and doesn’t warrant a price point of 6000 Euros. 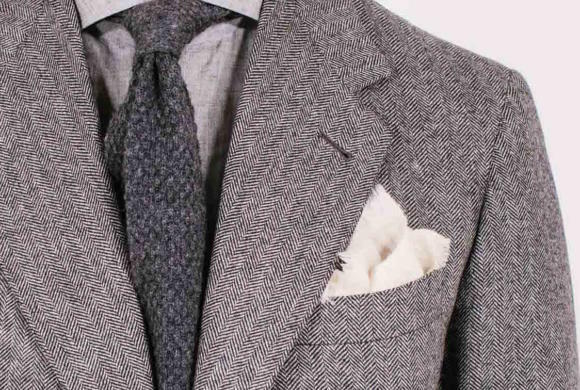 What is the mill, book and style number of the fabric of suit in this article? What about the shirt? The shirt is a grey linen from Canclini. However, I don’t think either cloth is available today – they rarely are beyond 2-3 years. Does this jacket have the widest shoulders of all your commissions? No, Anderson & Sheppard had wider shoulders. Hello. Do you have any information on the Herringbone fabric used ? Supplier / factory / book / item number? Dugdale having difficulty locating it. Would be great if you always provided this info. I doubt it’s available any more – this is a suit that was made five years ago. There is a general mis-impression that cloths are available in the same form for long periods. Some are seasonal, for only six months, and all books pretty much are changed every 2 to 3 years.